BlazeTaq™ Probe One-Step RT-qPCR kit is based on quantitative reverse transcription PCR (RT-qPCR) that uses RNA as starting material. It offers a convenient master mix to convert RNA to DNA and quantify in a one step reaction using hydrolysis probes. The kit is supplied with reverse transcriptase and a 5X master mix with a hot-start Taq DNA polymerase, dNTP and all required buffer components. Tests show that the BlazeTaq™ Probe One-Step RT-qPCR kit is compatible with diverse real-time PCR instruments and outperforms competitors' products on the sensitivity and specificity of RNA detection. BlazeTaq™ Probe One-Step RT-qPCR kit allows potent target RNA detection and quantification using hydrolysis probes in a single tube. RNA is converted to cDNA by a reverse transcriptase in the kit, and cDNA is amplified consequently by a hot-start Taq DNA polymerase. During DNA amplification, the target-specific probes bound to the target site on DNA are cleaved by the 5'-3' exonuclease of Taq DNA polymerase. Upon cleavage, the unquenched probes generate fluorescence for real-time quantification. RT-qPCR targeting ACTB(A), GAPDH(B), and B2M(C) using the BlazeTaq Probe One-Step RT-qPCR (red) kit and competitor's Taqman RT-qPCR kit (blue) with RNA extract from HeLa ranging from 10 ng to 0.1 pg in duplicates. Performance of singleplex and triplex RT-qPCR targeting ACTB(A), GAPDH(B), and B2M(C) using the BlazeTaq Probe One-Step RT-qPCR kit with RNA extract from HeLa ranging from 100 ng to 0.1 pg in duplicates. The standard curves of singleplex and triplex RT-qPCR show the same amplification efficiency. 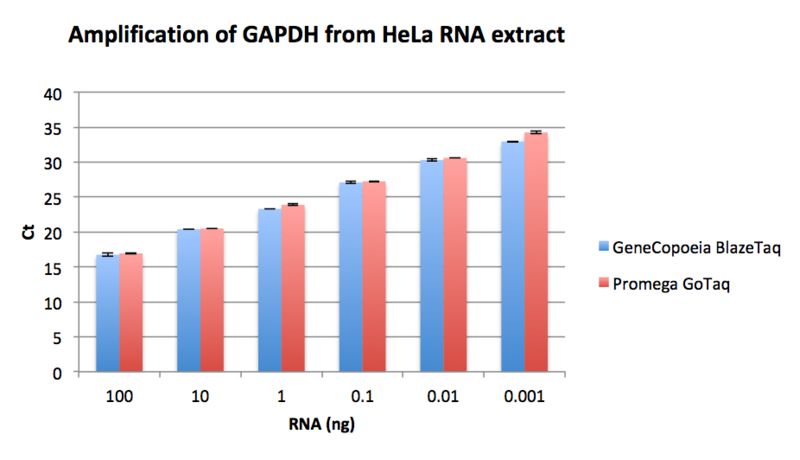 Performance comparison of BlazeTaq Probe One-Step RT-qPCR kit with competitor's RT-qPCR kit by the amplification of GAPDH from HeLa total RNA extract. This entry was posted in qPCR products. Bookmark the permalink.